I’ve been around new ways of working and learning for a long time, since 1995 to be exact. Coinciding with a significant life change, moving to live in another country, I recently took time out to try to make sense of how past insight can inform present action – and the future of work emerges from that. This post is the introduction to a series of posts on themes that arose from this extended sense-making exercise. Do you believe in better? Euan Semple says that Organisations Don’t Tweet, People Do. In the same way, organisations don’t do things differently, people do. In my experience, it’s been Chief Execs and functional heads in hierarchical organisations – Production Directors, Finance Directors, Marketing Directors (I’m thinking of specific people here) – who have believed that there are better ways of doing things. They’ve initiated and sustained new ways of working, influencing and persuading others to commit to change. There’s one other person who has influenced me deeply and she is a family member. A senior nurse responsible for a team that gives round-the-clock care, she set in motion a series of changes to working practices a number of years ago that transformed the performance culture on the ward. This was no flash-in-the-pan; the close-knit team she has nurtured continues to deliver excellent patient care. She did this using her instinct, drawing on her experience of people and knowledge of the working context. She had no experience of what she was about to do – she had never done such a thing before. When I asked her if it might have been useful to work with someone like me, she said yes. She would have known that the turmoil she was experiencing was normal. More than that, she would have appreciated knowing what others like her were doing. What other options were open to her rather than the things she did? And are you, like me, a serial incompetent? If she can do that in the sprawling UK National Health Service, then surely others can do similar in a part of an organisation for which they are responsible? I think that one of the biggest opportunities that social technologies create is democratising access to learning. They let us discover people and information, and connect us to others inside and outside our workplaces. My friend, Richard Martin (@Indalogenesis on Twitter) says “my strongest ‘work’ relationships are with people who are not on the same payroll as me.” That statement encourages me to believe that I’m not way off the mark. 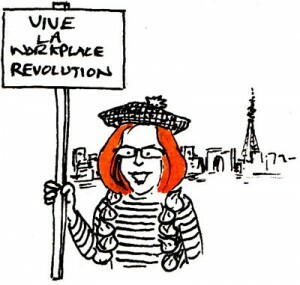 Like Peter Fry’s Trojan Mice, who challenge the status quo by creating incremental change, we can also get inspiration and courage from each other to start taking control of how we experience work – using our experiences as opportunities to develop and practice the skills we need for increasingly complex workplaces. We benefit, so do colleagues, customers and ultimately the business benefits too. So new opportunities exist for doing something and learning together from shared experience. But as work generally becomes more organisationally, socially and technically complex, we are going to have to get used to learning how to do things we’ve never done before. Neil Usher (@workessence on Twitter) says this means that we are all serial incompetents, learning and making it up as we go along. We might as well do it together. I don’t live under a rock and neither do you. We both know that workplaces can be stressful, unhappy and mean places to be, with people inside and across different organisations, functions, and departments at war with one another rather than co-operating. Too many of us work long hours, trying to meet impossible targets with squeezed budgets. How is it possible to learn or change anything when stressed and pushed for time? It’s not easy, but it is possible. If things are difficult, finding the time and energy to take back control of a situation that is causing you pain and trying to fix it for your own sake and for the sake of your workmates is very satisfying. Recent posts on my blog have been exploring alternatives ways of getting a quality business education outside of traditional business schools. I concluded that a quality, alternative business education is open to everyone but that it’s only those dissatisfied with the status quo and on a mission to challenge it – beginning with challenging their own mind-sets – who are going to commit the necessary time and effort. Since the alternative approach to business education I’m suggesting is based on doing something and learning from shared experience, then the same applies here. I suspect that it will be only those determined enough and frustrated with the status quo who be brave enough to commit the time and effort to change things. How unusual are these brave people? I don’t know. How to find them? Again, I don’t know. I’ll give it a go though. I’ll be writing a series of posts on new ways of working and learning in complex work contexts, in the hope that some of the insights from past knowledge might inspire or be useful to those instigators who are prepared to take action. The first ten posts will each explore a pattern that I see running through decades of research and experience on systems and practices linked to effective performance in the past – that I believe will continue to be fundamental as we move into a connected, networked future where complexity and uncertainty are operating norms. Then I’ll describe a couple of practical tools I’m developing, which are designed to help instigators to diagnose the boundaries, interactions and parameters that might help of hinder them in what they want to achieve.